Chicago pays high school principal Devon Horton $131,000 a year plus benefits to lead Wendell Phillips Academy. Horton has mingled with the mayor and dabbled in real estate. He also owes nearly $63,000 to the city. 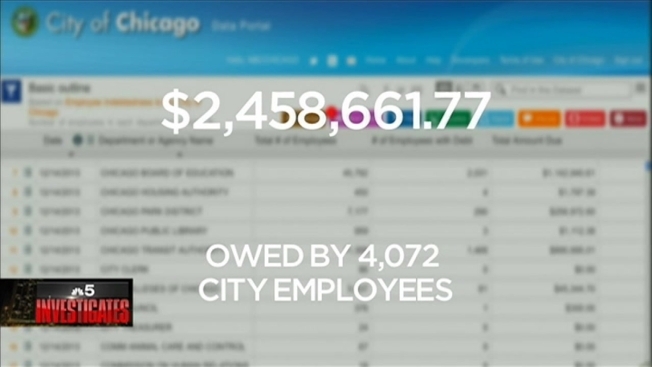 Millions of dollars have gone missing from some Chicago and sister agency employees who are slow to pay back debt in the form of unpaid traffic tickets, water bills and administrative judgments, according to city data obtained by NBC 5 Investigates. The amount of employee indebtedness as of Dec.14, 2013, is $2,474,657.66. A city spokesperson said the money owed would fund the city’s operating budget, which funds basic services like public safety and transportation. The city said since Feb. 14, it has collected or put into a payment plan approximately $4.2 million from city employees who owe debt. Through an open records request, NBC 5 Investigates received a list of the top 10 city department and agency employees who currently owe the most debt. The city claims the list includes employees who have yet to work out voluntary payment plans. Horton tops the list. Records show he currently owes $62,980.71 back to the city, despite his six-figure salary. According to the city, most of Horton’s debt comes from administrative judgments for property violations. One of his judgments for Department of Building’s violations totals $51,000. Horton told NBC 5 Investigates he has a court date scheduled for a property on West 103rd Street he said he could not rehab. “If the city says that I have to pay it back, it’ll be paid back,” Horton said. The list shows a Chicago police officer with an additional part-time job at a city college owes the city $52,460.42 for building code violations. Rounding out the list are employees from the CTA and Chicago Public Schools who each owe anywhere from $11,511.45 to $17,597.80. Chicago Public Schools is the biggest agency and its employees currently owe the most -- $1.1 million. Meanwhile, the CTA has yet to collect nearly $900,000 owed by its workers. In fact, 13 percent of all transit workers are currently in debt to the city -- more than any other city department. “It’s got to be frustrating to see that the city can’t even collect money from people who show up to city hall to work every day, let alone, from people who work elsewhere,” said David Morrison of the Illinois Campaign for Political Reform. "Mayor Emanuel takes the issue of employee indebtedness very seriously and has communicated to all department and sister agency heads to be vigilant about addressing this problem, and has ensured that all mechanisms at their disposal be used to reduce and attempt to eradicate employee debt." The city leaves it up to its sister agencies to collect, but a report by the Office of Inspector General said some city and sister agencies do more than others to get their employees to pay up. The inspector general noted that some city departments automatically suspend employees who owe even small amounts of money and they'll fire someone who continues to owe a thousand dollars or more. Neither the schools nor the CTA have these kinds of strict procedures in place to get their workers to pay up.